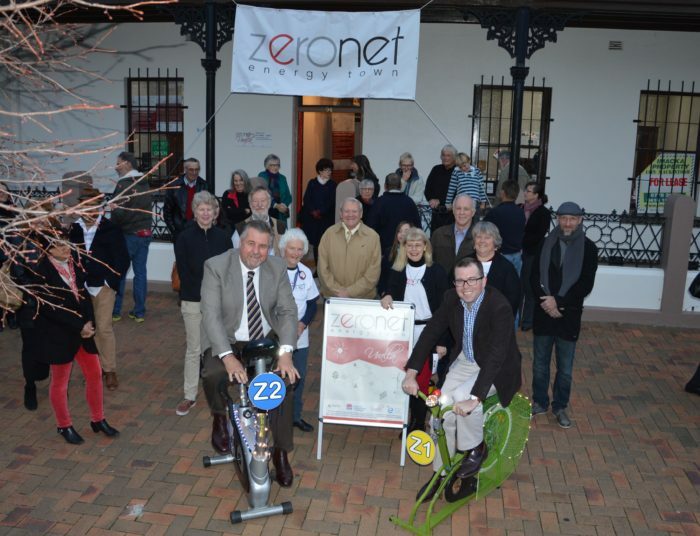 Northern Tablelands MP Adam Marshall, right, and Uralla Shire Mayor Mick Pearce peddling the Z-NET bikes at the opening of the Z-NET office in Uralla last Friday afternoon. URALLA’S Australian-first energy efficiency drive now has a “face and a place” with the opening of a new office to host the town’s Z-NET (Zero Net Energy Town) initiative. Local State MP Adam Marshall opened the office last Friday afternoon, in Uralla’s Neighbourhood Centre, and announced and additional $21,000 in State Government funding to keep the doors open. “Z-NET is an important, straightforward and smart concept,” Mr Marshall said. “It suggests that by making some well-understood changes to how we construct buildings and source energy, we can run our communities without needing to draw on massive supplies of energy from elsewhere. Mr Marshall has been an active supporter of the Z-NET project. His last funding announcement for the project secured $50,000 to employ Z-NET co-ordinator Steve Griffith. Overall, Z-NET has received more than $170,000 in State Government support. Mr Griffith said Z-NET is only partly about shiny new energy-generation technologies, although they are important. It is also largely a matter of increasing energy efficiency, and reducing energy waste. By the end of the year, the project will have selected 60 homes that will be assessed with a thermal imaging unit for areas of heat loss. Sometimes, Mr Griffith said, large improvements in energy efficiency can be made just by hanging the right curtains or sealing against drafts. The new Z-NET office will be a one-stop-shop for residents seeking information on such matters, and will give Z-NET a visible presence in the town. Mr Marshall said the Z-NET initiative is performing a service well beyond its headline task of making Uralla a zero-net-energy town. “The work that Uralla is doing marks out the path for other towns wanting to go down the same track,” he said.